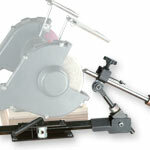 Use it with your bench grinder to sharpen bowl and spindle gouges more accurately and easily than ever before. This patent pending, heavy duty, locked-in guide system aids in creating side grinds that are automatic mirror images, with same angles, depth of grind and smooth finish......every time. It has built-in settings for standard grinds, and is capable of custom grind settings. 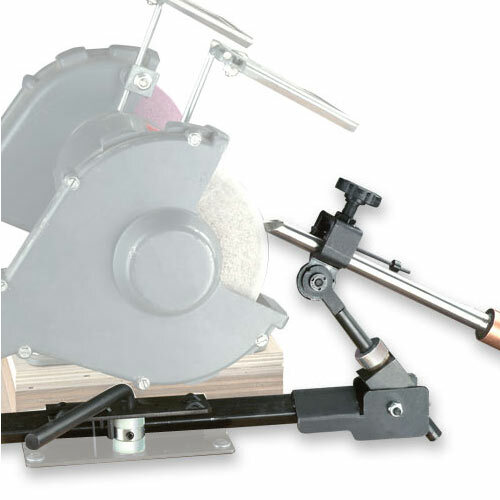 The guide system helps keep the gouge on the grinding wheel, preventing accidental run off that can result in injury to your hand. It also controls the placement of the gouge to the center of the wheel, helping to eliminate jamming the gouge tip into the grinding wheel - which can damage or even destroy the wheel. The gouge holding head uses a bearing to lock down the tool - finger tightening creates a very secure non-slipping lock. The system immediately adapts to other locking bases without modification.